I did say in an earlier post that you can rely on local printmakers to put on a good show and here’s more proof. Maybe the only problem I may have is over-familiarity with the art/artists, at least for me. 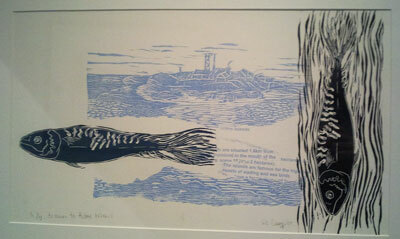 I haven’t seen Gill Curry‘s series of prints relating to the marine life around Hilbre Island before – very nice. I also like Anne Beare‘s richly coloured etchings of an old Oak Tree. Also featuring works by Lisa Who, Mike Hatjoullis, Grace Horne and Eileen Summers. Heralding in the New Year, an exhibition of etchings, linocuts and screen prints by six artists living locally.